People with diabetes might soon be able to manage their disease more effectively and reduce their risk of long-term complications using wearable glucose monitoring systems. “Scientists are getting closer to producing such skin-worn flexible devices,” says Joseph Wang of the Department of Nanoengineering at the University of California, San Diego in the United States. Wang and colleagues review progress in the field in the journal Talanta. Millions of people with diabetes worldwide, currently monitor their blood glucose levels using inconvenient and painful sampling of blood from their fingertips. Without doing this they can't effectively adjust their insulin levels to keep their blood glucose within a safe range. However, fingertip tests do not continuously monitor levels and the inconvenience of repeatedly performing tests leads some patients to check less often than is desirable. Less effective monitoring increases the risk of the long-term complications of diabetes, including damage to nerves, eyes and the circulatory system. It also offers less protection against the extreme swings into high or low blood glucose levels that can cause disorientation, unconsciousness or even death. 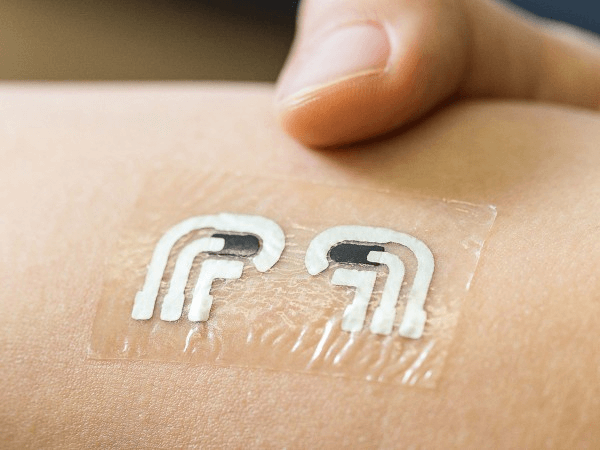 Several research groups are reporting progress in developing devices that monitor blood glucose non-invasively, using electrochemical sensors worn on the skin. “Achieving reliable non-invasive glucose biosensing will represent a real breakthrough in the management of diabetes,” says Wang. The sensors being developed and currently under trial include small meters strapped to the arm, skin patches and even tattoos. The technology can then transmit data wirelessly to handheld devices. More than 10 years ago the US Food and Drug Administration approved a wrist-worn system called GlucoWatch, manufactured by Cygnus Inc. This sensed glucose levels in the skin and used these to calculate the likely levels in the blood. Despite promising trials, this device was soon removed from the market due to problems with calibration and skin irritation. Wang and his colleagues are working on an ultra-thin and flexible sensor that is applied to the skin. This avoids the discomfort found with GlucoWatch and early tests are promising. Future work will focus on larger-scale trials and efforts to make the system more physically robust. Other researchers are exploring how skin patches can use the glucose levels in sweat as an indicator of overall blood glucose concentration. Considerable challenges lie between the current state of research and the commercialization of reliable and robust continuous monitoring devices. The most crucial of these is to establish a correlation between what the sensors detect and the real blood glucose concentrations. Further research is also needed to account for the effect of different levels of exercise and differences due to the location of the sensors. “The development of these skin-based glucose monitors is just beginning,” cautions Wang. He emphasizes the further refinements in accuracy and calibration and extensive clinical trials required before the hopes become realities. In the longer term, however, Wang and his co-authors conclude that wearable 24/7 glucose monitoring is “poised to significantly increase its impact on medicine,” making diabetes control simpler and increasingly effective.